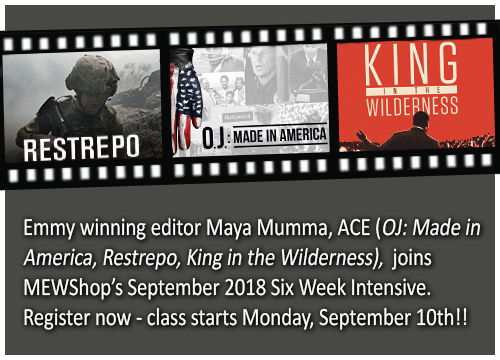 MEWShop proudly announces that Documentary film editor Maya Mumma, ACE, will join our September/October 2018 Six Week Intensive. Maya was an editor on the Academy Award winning documentary O.J. : Made in America for which she was honored with the 2016 Best Editing award from the LA Film Critics Association, an ACE Eddie, and a Primetime Emmy. Maya began her career in the edit room of the Academy Award nominated documentary Restrepo, which won the Grand Jury Prize at the 2010 Sundance Film Festival. She has gone on to edit the Emmy nominated films Which Way Is the Front Line From Here: The Life and Time of Tim Hetherington (HBO) and Whoopi Goldberg Presents Moms Mabley (HBO), the Peabody Award winning Mr. Dynamite: The Rise of James Brown (HBO), A Journey of a Thousand Miles: Peacekeepers (TIFF 2015, PBS 2018), the Netflix original series Daughters of Destiny, and most recently King in the Wilderness and John McCain: For Whom the Bell Tolls for HBO. Newer PostAcclaimed Editor Tim Streeto, ACE, joins Our Next Six Week Intensive Starting November 5th!